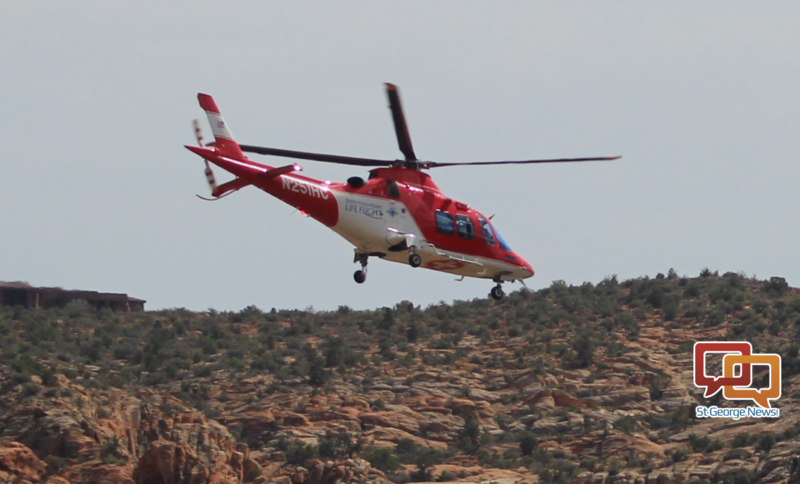 ST. GEORGE – A motorcycle crash in the wilderness on the south side of Pine Valley Mountain resulted in a St. George man being airlifted to the hospital Wednesday night. Around 7:40 p.m., the Washington County Sheriff’s Search and Rescue team was dispatched to an area off of old Turkey Farm Road out of St. George that leads into the Red Cliffs Desert Reserve, Washington County Deputy Darrell Cashin said. Two men on off-road motorcycles had gone up the old Turkey Farm Road and onto one of the many dirt roads used by the U.S. Forest Service and Bureau of Land Management that spider off from it. During their ride, one of the riders hit something and ended up flying over the handlebars of the bike and then hitting the ground. The general terrain of the area is rugged and rocky, with the Forest Service roads out that way not being much better. Because of this, regular emergency vehicles built to run on pavement don’t have much of a prayer getting out there. This resulted in the search and rescue team being mobilized. A medic with the SAR team reached the scene first and found the man who had crashed. While he and his friend were wearing full motorcycle safety gear, it was ultimately determined the man, a 39-year-old St. George area resident, had possibly injured his neck and back. “He couldn’t remember what had happened, so that also concerned us,” Cashin said. Intermountain Healthcare’s Life Flight helicopter at Dixie Regional Medical Center was alerted and initially put on standby. Life Flight then took to the skies once it was decided flying the man out would be the best course of action as there was no other way to take him safely out of the area by foot or vehicle, Cashin said. There was just a little snag at the time though – there wasn’t a clearing large enough for the incoming helicopter to land. It was after dark when Life Flight arrived and then flew the man back to DRMC, Cashin said. The operation was concluded shortly after 11 p.m. The video clip featured in the media player at the top of this story, courtesy of the Washington County Sheriff’s Search and Rescue team. Fourteen members of the search and rescue team – all volunteers – responded to Thursday night’s incident. The county’s search and rescue team has responded to over 20 calls so far this year, Cashin said, which includes four calls over a 24-hour period just this last weekend. If this frequency of call outs remains consistent throughout the year, 2017 could beat 2015’s record of over 100 search and rescue operations, he said.